Thanks for a great design. This boat handles beautifully. Last weekend was the first beach camping trip along Lake Michigan and I'm very satisfied with the capabilities and performance of this boat. There's ample room to stow camping gear. The bench seats covert nicely to a double berth. 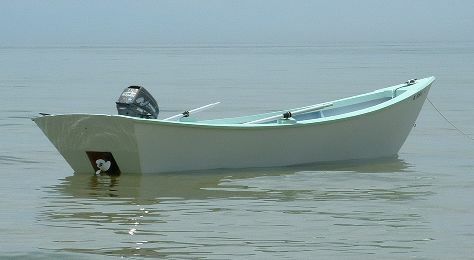 The boat floats in 3"-6" of water and the fuel consumption should give a respectable range (~1.2 gal./hr.). My only complaint is with the motor well. I built the motor well around a 15" shaft, but found that the new four strokes had a hard time swinging from stop to stop within the well. I added a 20" motor board to fit a Nissan 18 hp motor which drives the boat at 12 mph at half throttle and 15 mph at full throttle. The 25 hp 4 strokes just would not fit. I wish the motor would move the boat at 20+, but 12-15 is very comfortable. Slosh boards have taken care of most of the water that splashes in through the motor well. A pair of small bilge pumps take care of the rest. The next step is to add camping canvas and possibly floatation. 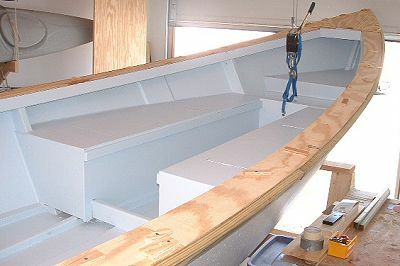 I met another boater over the weekend with a similiar homebuilt design that had a hinged door covering the outflow in the transom. 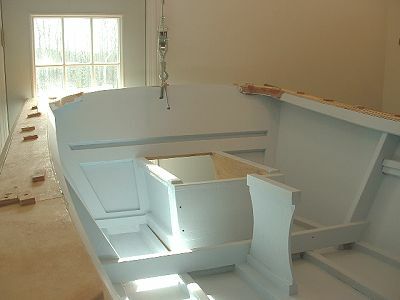 He claimed to have run the boat in 10' seas and said that the small door swings shut with following seas.